I love it! Nicely done. But…I’m still thinking about those chocolate chip cookies. Me, too. 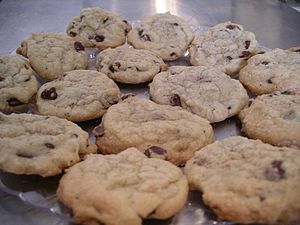 I’ve been thinking about chocolate chip cookies ever since. Looks like a lovely recipe! I wouldn’t mind trying some. Yeah! Or chocolate croissants with that hazelnut chocolate in the middle with a light crust. That would be great, too. Sigh. Really should get to the gym instead. Fun post, Robert, and clever too! Hope it gets you a lot of chocolate chip cookie lovers as readers! Hey, btw, is it an example of applying John Locke’s famous “transfer” principle for successful marketing? If so, congrats, because it doesn’t come off that way – just all very natural and fun. Heh. I wasn’t thinking about John Locke but I guess it uses the same principle to get inside the reader’s defences. Don’t know if my description worked though. I haven’t heard back from that potential reader. Probably won’t. Might have scared them away from books and into baking cookies. Best case is you eat chocolate chip cookies while a storm rages outside and there’s nothing to do but snuggle up, relax and get transported into someone else’s life through the magic of a book. What I just described is my ideal. I don’t think that’s transfer marketing per se. It’s just what I want.